Last month on the Home Shopping Network's 24 Hour Crafting Day Anna Griffin was the Today's Special Value with a bundle of several beautiful lace embossing folders with coordinating dies that cut some of the border folders, plus other beautiful dies. Here are the projects I created for that bundle of beautiful goodies. 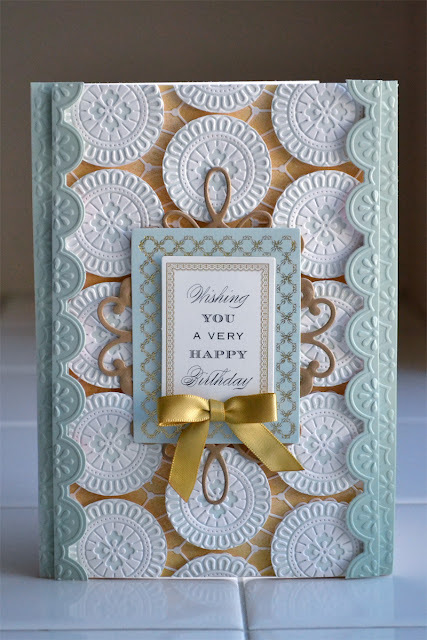 On the above card I inked the embossing folder with Anna's caramel colored ink before embossing the cardstock to create the background, then I inked the embossing folder with aqua ink before embossing another piece of ivory cardstock and punched out the circles in the design. 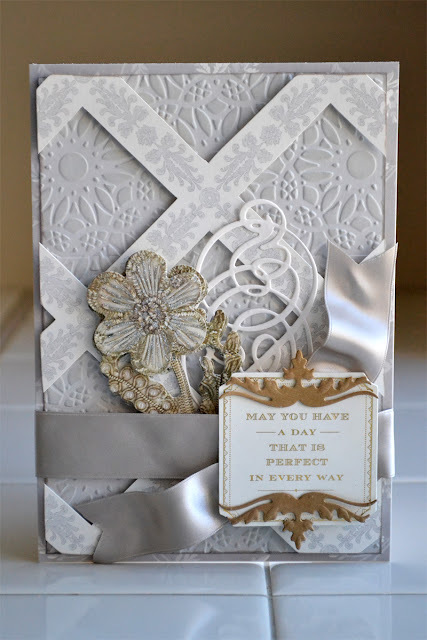 Adhering them to the card with foam squares really made them pop. 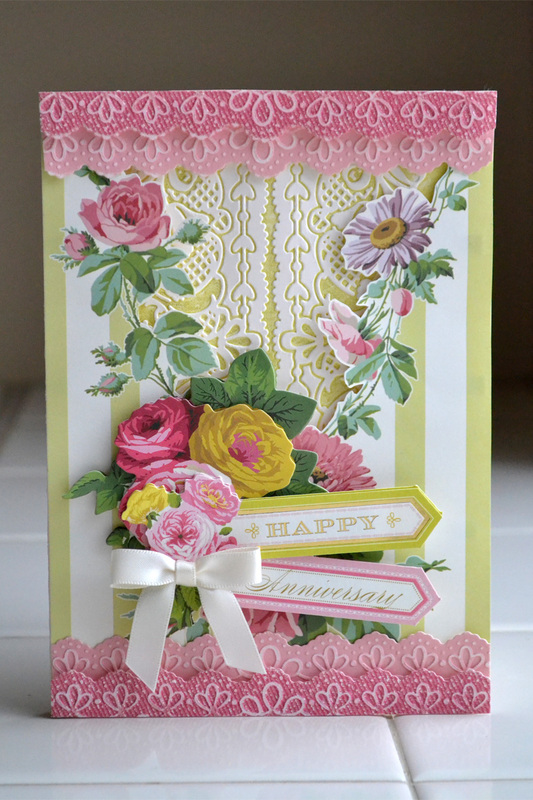 On several cards in this set you'll notice I fussy cut some of the embossed designs. It takes some time, but the results are worth it! 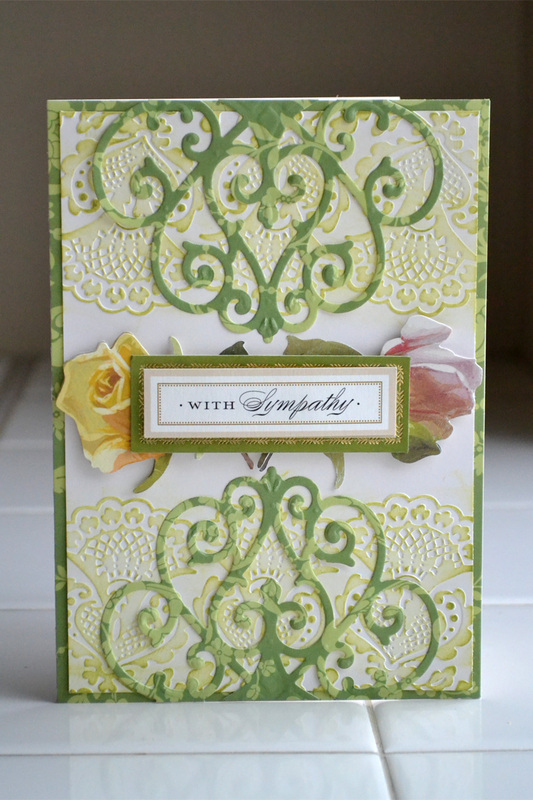 The sentiment for this card was cut with my Cricut using one of Anna's new Soiree fonts. I like the peek-a-boo feature on this card. The ink embossed cardstock looks like patterned paper. 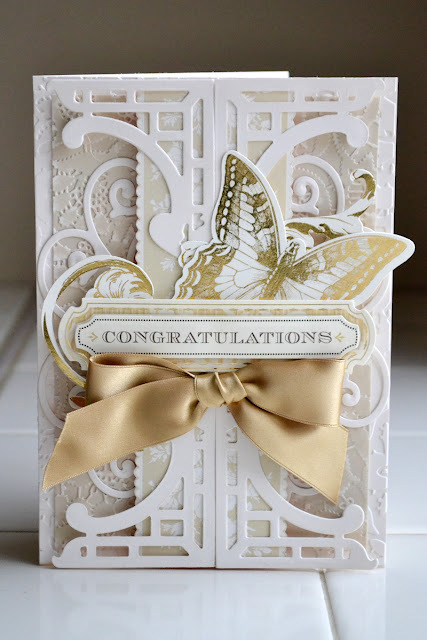 For the above card I embossed the top and bottom of the cardstock using just the end of the folder, and then carefully rubbed ink over the embossed design. 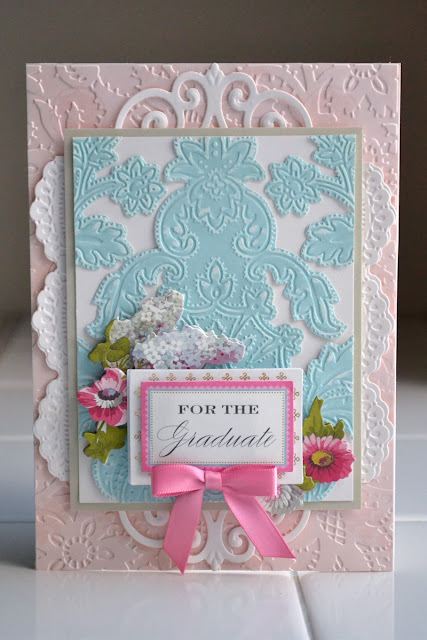 Layering the die cut over the embossing adds some lovely depth to the card. I think the card above is my favorite. 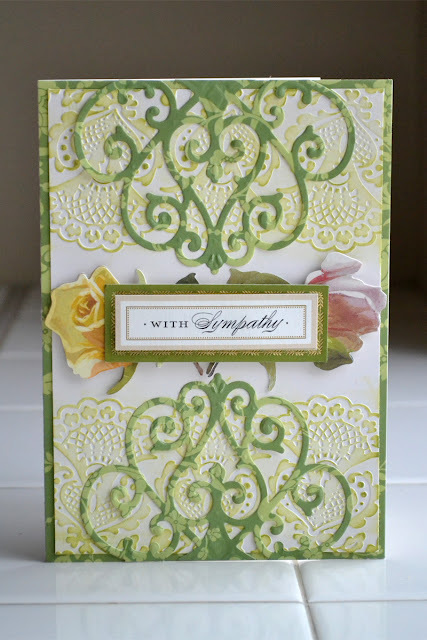 Lots of depth and elegance to this card. 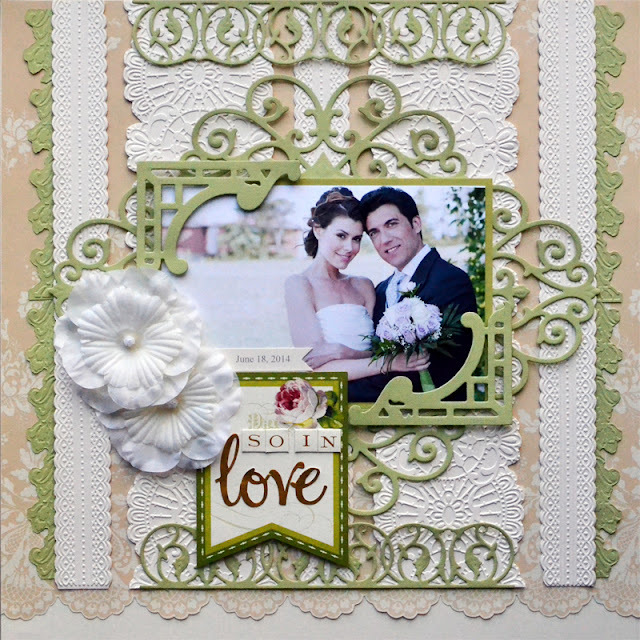 It would be a great wedding card, don't you think? 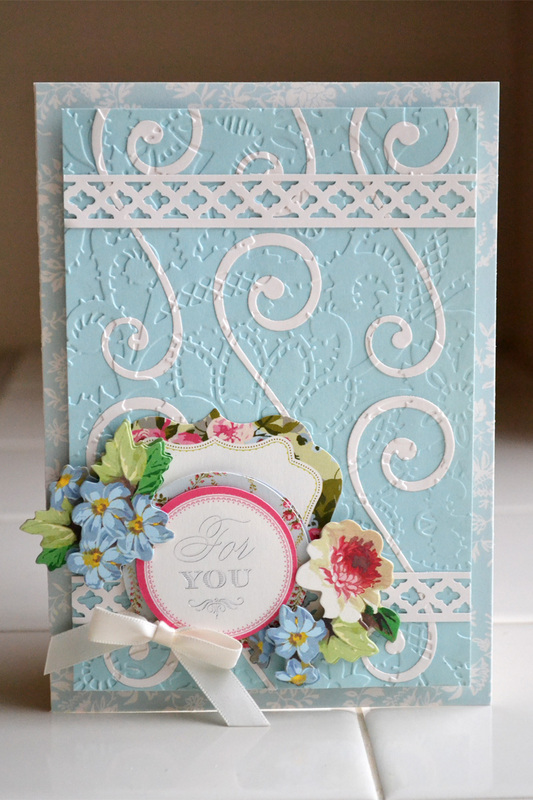 These folders and dies also work great on scrapbook pages, as you can see below. There are still some of these bundles available on HSN. Click HERE if you're interested in learning more or purchasing a set. I had a blast working with these! Your cards and scrapbook pages made with the Anna Griffin dies & embossing folders are beautiful! 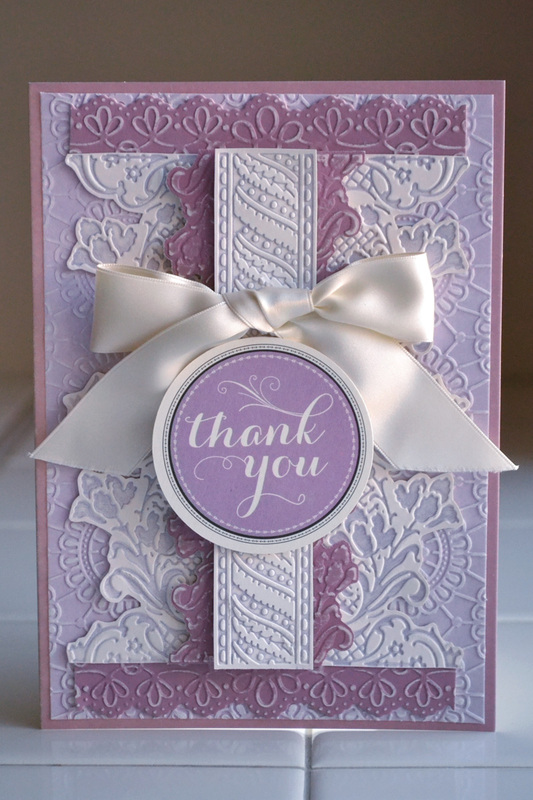 I have a thing for purple right now so I love the Thank You card - but they are all so gorgeous! 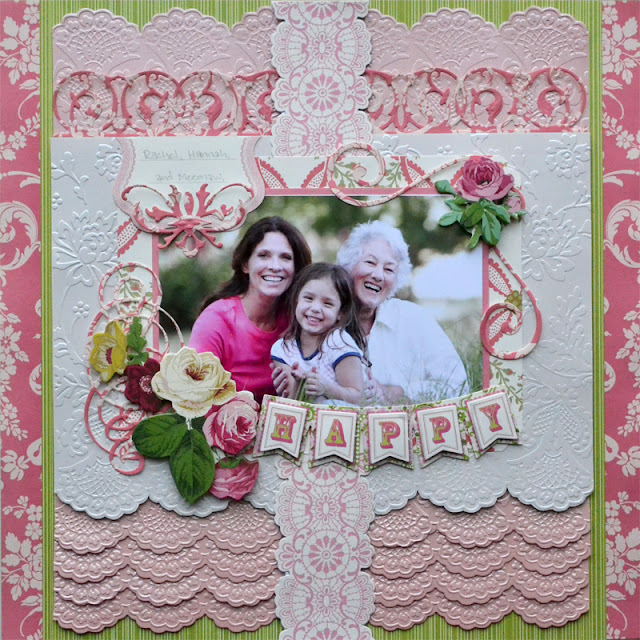 Thank you for sharing your work and providing this top notch inspiration! Whenever Anna Griffin presents new products, I always want to see what you have accomplished with the items. These are the best! My favorite is the "congratulations" card - you made me see the corner elements in a whole new way. Beautiful. Not a silly question at all. All of the sentiments with the exception of two are pre-made and come in Anna's kits. 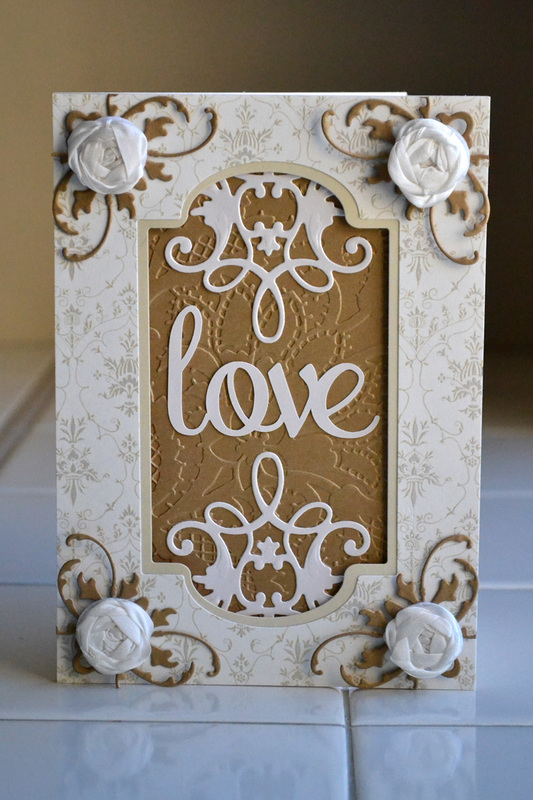 I cut the sentiment on the "love" card with my Cricut machine from Anna's paper, and I used Anna's alpha stickers to make the title on the "So In Love" scrapbook page. Hope that helps, and thanks so much for stopping by my blog! It helps a great deal! Thanks for your detailed reply. 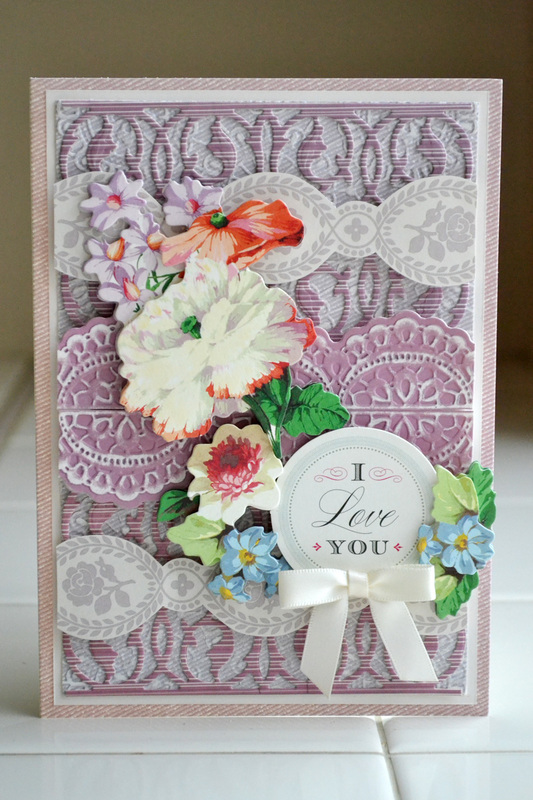 I guess I have card making envy; you take Anna's inspiration to a whole new level.